Welcome to Regal Auctions. We have two weekly live auctions that occur on Wednesday nights at 6:30pm and Saturdays at 11:00am. Our facility is centrally located in Calgary Alberta for your convenience. Review our current listings to get up to date information on our auction inventory. Register for online bidding or attend our live sale for maximum fun and excitement. Take our Customer Service Survey and let us know how we're doing and how we can improve. We're open all day Friday April 19th. Viewing will be from noon until 8:00pm. That's right. And not the cheap stuff either. 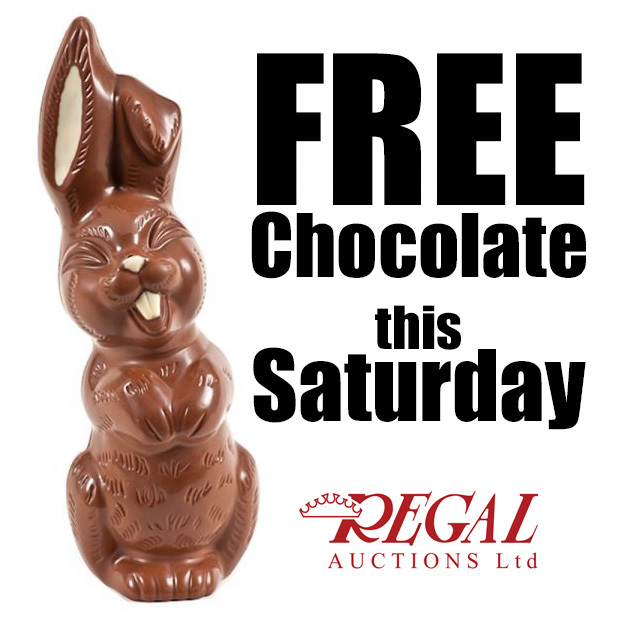 Free chocolate for everyone in attendance at our Easter Saturday Sale on April 20th. Regal Auctions now offers a full range of detailing services. We can do everything from a quick spray down to a world class, comprehensive, deep clean and power polish. Click here to check out our detailing packages. Are you on Regal Wi-Fi? Save your data and use our free high speed connection. We have free and secure phone charging stations at the Front Counter.